Started in 2000 as Get Flanagan A Stadium, Inc. (a 501c3 non-profit corporation), to raise awareness and funds for a stadium at Charles W. Flanagan High School, our dream became a reality. A partnership between the School Board of Broward County, the City of Pembroke Pines, and Get Flanagan A Stadium, Inc., raised over $1.4 million for athletic facilities at Flanagan High School, including stadium seating for 3,400, lights for night games, press box, sound system, concession stand, athletic marquee, top of the line scoreboard, and more. In the past few school years we have completed the installation of baseball, softball, and football practice lights, as well as resurfaced the track. Restrooms and more buildings are still to come. 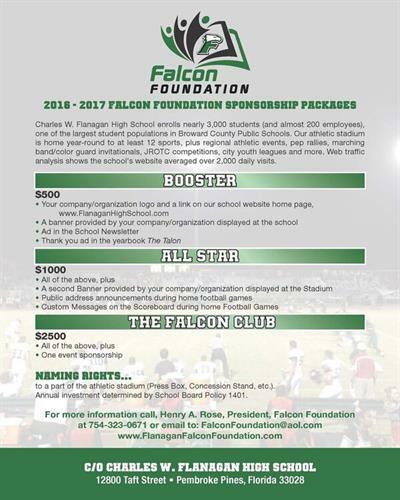 Because the stadium is complete, Get Flanagan A Stadium, Inc. has evolved into the Falcon Foundation, Inc., for general support of Flanagan High School and the Flanagan Innovation Zone schools.